Many Americans love celebrating Halloween, which occurs every year on October 31st. Near the end of October, it is common to see people of all ages wearing costumes, carving pumpkins, and doing other fun Halloween activities. 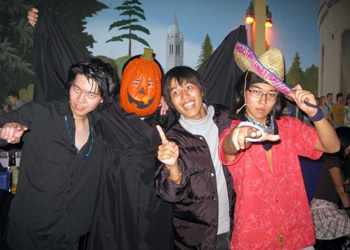 If you’re planning to study English in California, you’ll find plenty of Halloween activities to enjoy in October. It will be a nice way to explore some of America’s culture, and it is also a lot of fun! Here are a few fun Halloween activities to enjoy. Carving pumpkins is a fun Halloween activity everyone should try while in the USA. The tradition began in Ireland and Scotland between the 1600s and 1800s. Children would carve scary faces into turnips to frighten spirits away from their home. Settlers brought the tradition to America, where pumpkins were used instead. People don’t think that pumpkins scare ghosts away anymore, but they still love carving them! You can find pumpkins at many grocery and hardware stores. You can also go to a nearby pumpkin patch to pick your own! Get a pumpkin, grab a knife, and carve a scary or silly face into it. This is a fun activity to enjoy with friends from your intensive English studies, so make sure you try it! Americans love to dress up in costumes at Halloween. Some people dress up as favourite characters from movies. Others dress up like scary monsters, or animals, or other fun things. Whatever they dress as, everyone has fun playing pretend for the day! Halloween parties where everybody goes in costume are very common in October. Why not go to one, or even have your own Halloween party with the many friends you’ll meet at school? A Halloween party can be a great time to practice all the English conversation skills you’ll be learning at school. It can also be a good place to meet locals from all kinds of different backgrounds. Find a good costume and get ready for fun! It can be fun to get a little bit scared. That’s why it’s worth trying another fun Halloween tradition: watching scary movies. Every year in September and October, scary movies are released for viewers to enjoy. It can be a fun bonding moment to watch them and get scared with friends. Many horror movies have silly moments to laugh at, too. As a bonus, watching a scary movie can be good English practice. Hearing the dialogue can reinforce vocabulary and conversation skills you are learning in your English classes in California. If you are watching a DVD or a downloaded video, you can also turn the subtitles on while you watch. This gives you a little extra reading practice and can also help make sure you understand everything that is being said. Do you want to learn English and explore a fun new culture? Contact English Studies Institute to find out how you can learn English in the USA!